Everyday items such as a bottle of wine, a T-shirt or a box of cereal can be enhanced with web connectivity and a digital identity, making them smart, trackable and interactive. Digitized products create new data streams at every point along the supply chain from manufacturing to post-purchase customer experiences. The rise of smart products has created a new concept: The Digital Product Lifecycle. The Digital Product Lifecycle weaves together the disparate stages of supply chain management and customer relationship management in a connected, cyclical way, powered by real-time data. 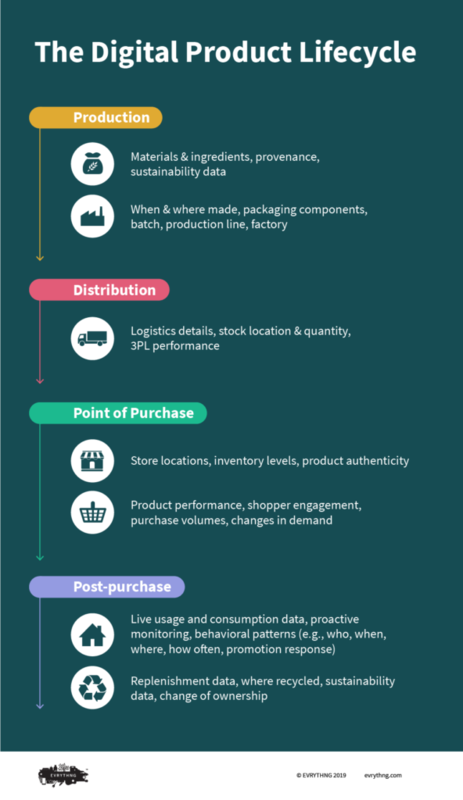 This infographic shows how new data streams from #BornDigital products enable insights and applications through the product’s lifecycle. Get all the details with The Digital Product Lifecycle E-Book.